​"Thank you so much for a terrific day. We learnt so much, the ponies were great and the instruction second to none. We really couldn't believe that we played our first chukkas at the end of the day - you have created some budding polo enthusiasts. We will be back - guaranteed." For groups of 4 or more. Welcome to Offchurch Bury, join us for a tea or coffee and pastries. Meet Grant, your professional coach for the day. Before mounting up we start by practising shots using a short polo mallet. We play on out feet to practise hitting the ball and team tactics. 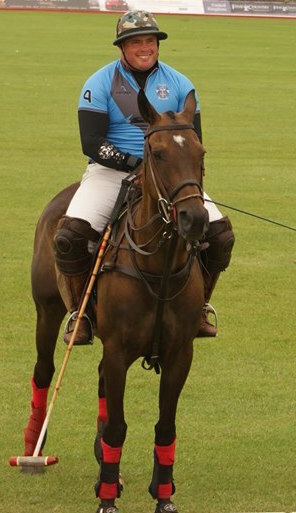 All horses used for Polo are known as Polo ponies. Meet your pony before the fun begins. Just before we get you into the saddle, we kit you out to look just like a professional polo player. You'll learn together as a team, your coach will teach you basic riding skills and how to hit the ball. We discuss the theory and tactics of the game over a delicious buffet lunch. We take to the field again for more practise, we then divide you into two teams and play a 4 chukker match. Time to celebrate the winners of the game with a traditional prize giving and photos. Time to sit back and relax with a glass of champagne and a cake and watch the professionals play a short exhibition match at speed.